Ofsted confirms Costessey Infant and Junior Schools are “good”. 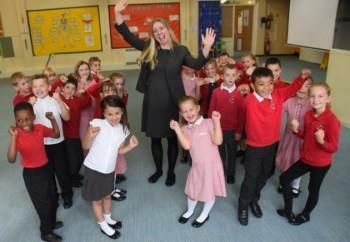 Mrs Lawson and pupils at Costessey Junior School. An infant and junior school that share the same headteacher are celebrating after separate Ofsted reports confirmed they both remain “good” schools. The inspections for Costessey Infant and Costessey Junior schools were the first since they joined the Evolution Academy Trust, based at the junior school and run by its former head Tony Hull. The reports praised Katie Lawson, the executive principal of both schools. Inspector Maria Curry, who carried out the short inspection of the infant school on June 7, wrote: “Since you became executive headteacher of both schools, staff from the infant and junior schools work closely together. Staff told the inspector that they valued this.